The Trump administration is seeking the dismissal of a suit alleging the nonprofit helmed by former president Jimmy Carter has used taxpayer funding to provide material support to international terrorist groups, including Hamas. A hearing on the dismissal motion will occur on April 25, though legal experts handling the case are hoping to convince the DOJ to reverse its opinion beforehand, according to those familiar with the proceedings. Evidence presented in the case purports to show the Carter Center accepted millions in government grants while falsely certifying it was not violating prohibitions on providing material support to terror groups, which include a broad range of factors including lodgings, expert advice, and other types of support. Former President Carter's ongoing and well-documented interactions with Hamas and Popular Front for the Liberation of Palestine (PFLP) are tantamount to material support for terror groups, the suit alleges citing evidence Carter hosted these officials at his Center's offices. While the Trump administration's lawyers admit in their motion to dismiss that Carter has in fact met with designated terrorists and terror groups, they are seeking to have the case tossed because it would be too expensive to adjudicate in court. "Representatives of the Carter Center have engaged in discussions and meetings with members of Hamas and the Popular Front for the Liberation of Palestine," the government's motion states. However, "the primary purposes of these activities were to facilitate dialog between the Palestinian factions and to urge Hamas to recognize Israel's right to exist, forgo violence, and accept previous peace agreements," Trump administration lawyers maintain, adding that these activities were not concealed from the public. Due to the publicly available nature of these interactions, the DOJ maintains the activity should not be classified as material support for terrorists, according to the government's dismissal motion. The DOJ did not immediately have comment on the case. 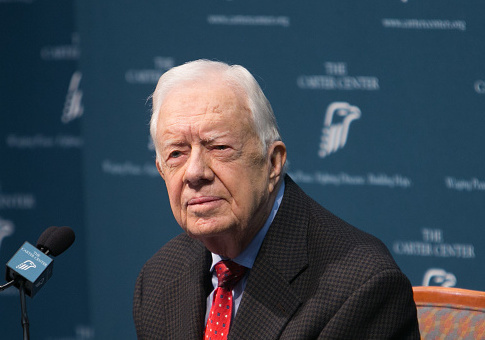 A representative for the Carter Center did not respond to multiple Free Beacon requests for comment. The DOJ maintained in its motion to dismiss the case that the core issue represents "a difference of opinion with the Carter Center about how to resolve conflict in the Middle East" and, for that reason, does not violate laws barring material support to terror groups. "If the United States were to decline to intervene in the case … the United States, as the real party of interest, likely would be required to devote considerable resources to the litigation," the DOJ argued. "The United State has determined that this action should not proceed," the DOJ wrote. "According to U.S. law, the provision of expert advice or assistance otherwise known as material support, even if meant to promote peaceful and lawful conduct, can facilitate terrorism," Segal said. "The logic is simple. Any service provided to a terror group can help free up other resources within the organization," Segal explained. "Taking into account that a terror organization, ultimately, aims at executing acts of terror, by freeing resources from other needs, you are very likely to contribute to the organization's illegal acts of violence, whether you intended to do so or not." Services like those provided by the Carter Center can in fact "contribute to the terrorist organization's own legitimacy," according to Segal, who said arguments revolving around the Carter Center’s intentions in providing such services are irrelevant to the legality of the case. "It seems that the DOJ is attempting to bury this case by making technical arguments as to this procedure," Segal said. "Beyond our professional disagreement regarding these particular claims, the question is this: Even if their arguments are correct, why isn't the government taking different measures to put a stop to this illegal activity?" Update: The Department of Justice declined to comment. This entry was posted in National Security and tagged Hamas, Jimmy Carter, Terrorism, Trump Administration. Bookmark the permalink.